Dum Dum Girls Release Video For "Rimbaud Eyes"
Fresh off their two performances at the 2014 Coachella Festival, Dum Dum Girls found some time to release a video for the kickass tune “Rimbaud Eyes.” I love this tune and it saddens me that the song does not have the same effect when performed live. 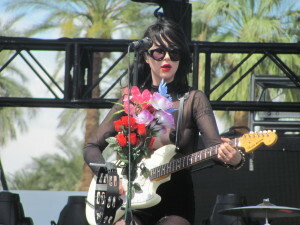 Of all the great tunes that DDG performed at Coachella Weekend 1, “Rimbaud Eyes” unfortunately was not one of them (IMO). I got the same feeling the night the women performed it on Letterman. I could be wrong… maybe I was just paying too much attention to Dee Dee’s outfit (or lack thereof).